Lion PCC Bob Beard has been a member of the Emily-Outing-50 Lakes Lions Club since February 1990. Lion Bob was elected in to the 5M Lions Hall of Fame in 2011. Lion Bob credits his loving and faithful partner Lion Rita for making everything he has accomplished in Lions possible. Lion Rita helped Lion Bob keep a level head and made him realize that without the help and dedication of others none of this would be possible. All of this changed when Lion Bob accepted the Secretaries position in 1992.Serving as club secretary Lion Bob earned 100% Secretary Award. In 1993 with Rita by his side Lion Bob became a Diabetes Committee Chair. He was involved with the Diabetes Project on the District or Multiple level until 2004. Although Lion Bob did not actively seek leadership positions they came call for him. 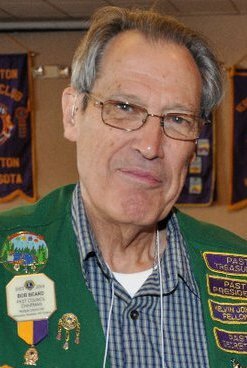 Lion Bob was elected Vice District Governor for 2001-2002. 2002-2003 he was a 100% District Governor and 2003-2004 Lion Bob was elected to the top leadership position in the Multiple District as he became Council Chair. Lion Bob has been highly decorated. He was Emily-Outing-50 Lakes Lion of the Year 4 times. Lion Bob is a Melvin Jones Fellow, Has been awarded a Diabetes Dream Catcher, International Lions President Certificate of Appreciation, Lions International Presidents Leadership Medal and Lions International Presidents Service Medal.